Sometimes you just need a muffin. Growing up, I don’t remember my mother often making muffins–as a caterer, she was constantly making wedding cakes and brownies, cookie bars, your usual tastes-really-good-but-easy-to-make-in-bulk-fare, and, for some reason, I don’t remember muffins being a regular part of the rotation. I’m sure there were some breakfast spreads with muffins involved, but I don’t have a clue what kind she would have made for it. Mom, were you a banana or bran or blueberry muffin fan (seems like a lot of muffins being with “B,” no)? And, following in her steps, I too rarely make muffins. Sure, I can blame it on the rather gluten-less nature of our house right now, but even before that (and looking through the blog), it appears I’ve posted about muffins five times in just as many years. It’s high time to add another to the list! These muffins were crafted out of necessity–a few extra over-ripe bananas sitting in our fruit bowl and an overwhelming craving for chocolate. Although I’ve mostly kicked my sweet tooth (G, for example, ate almost all of those brownies from a week or two ago), occasionally it flares up and “I need chocolate RIGHT NOW” is the only thing I can think about. Hence muffins, with chocolate. I mean, is there any other way? I’ve actually made the recipe more than once (a rarity for me), the first time with eggs, the second time fully vegan, and, I have to admit, while the first version was fluffier and rose more in the loaf pan, the muffins are buttery and rich and far more decadent for whatever reason. I’m sure there are ways to perfect the recipe more, but I’ll leave that to your tinkering. Photogenic these aren’t, but, mmm, do they hit the spot on a brisk spring morning like we’ve been having lately. And trust me, the extra step of roasting the muffins is well worth it–these are the most banana-y muffins I’ve ever eaten and the caramelization just adds another layer of goodness. Line a baking sheet with foil or parchment paper. Place the bananas on it and puncture five or six times with a sharp knife. Roast until the peels are black and the bananas are bulging with juices running. (Should take 15-20 minutes.) Remove from oven and let cool. Once the bananas are cool, cream the Earth Balance and sugar in a stand mixer until light and fluffy. Add the bananas, yogurt, milk, and vanilla and mix until combined. In another mixing bowl, add all the flours, xanthum gum, baking soda, and salt. Pour the flour mixture into the banana mixture and beat until smooth and combined. Add chocolate chips and pecans if using, stir to mix in. Spray a muffin tin with spray oil and spoon batter into each muffin cup (about 3/4 of the way full). Place in oven and bake for 15-20 minutes, or until browning on top and an inserted knife comes out clean. Oh, gosh, these sound incredible! I love the idea of roasting the bananas first. 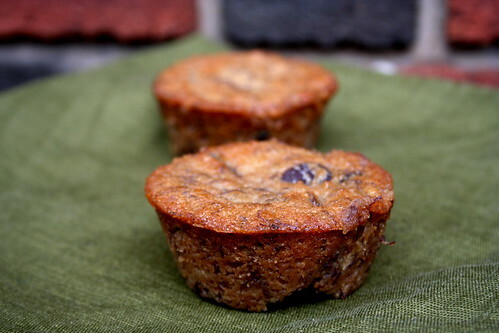 muffins are definitely my favorite baked good, and banana is one of the best flavors! Well done. They look gorgeous too. I would never have thought of roasting the bananas…brilliant!